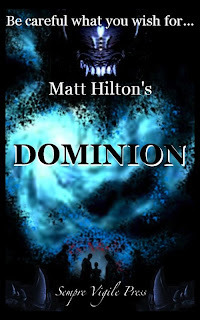 I mentioned previously about my horror thriller 'Dominion' and how I chose to self-publish it as an eBook to avoid reader confusion etc regarding my usual Joe Hunter thrillers, and how I wished to keep the books as separate entities. This hasn't changed, and the book is available to download via all the Amazon platforms, .com, .co.uk, .de, .it, etc. However, what did become apparent was that many of my readers still prefer a paper book over an electronic one, and various people asked that I make 'Dominion' available as such. I've done so, making the book a POD product via Lulu.com (see the link above). One reason why I resisted at first, was because with POD there's always a slight hike in price. This is because the publisher charges per page and 'Dominion' is a hefty read of over 175,000 words (500 pages), and then also expects a take from the 'profit' margin, not to mention adding postage costs. Any way, because people did ask, I decided to make it available and allow my readers to decide if they wished to pay the price for the product they demanded. To help out, I've cut my part of the profit, reducing the overall cost by 10%, and bringing down the cost to what you'd expect to pay for a similarly sized trade paperback in bookstores. Regular publisher feedback was generally very good, though none were in position to offer publication. I knew I had a good book, but it didn't sit with these publishers' styles or catalogues and may prove awkward for them to market to the general public. However, the book was good enough in my opinion to find its own market. I had sent portions of the book to a selection of readers both from the horror and thriller communities and the feedback was that it worked for both markets, yet didn't fully sit in either. Therefore I was happy that I'd developed my own sub-genre from both angles. Is it a thriller with horror, or a horror with thrills? I'll allow my readers to decide that, I thought, and the only way to do that was to make it available to them. I spent many, many hours working on, and then revising and editing Dominion, and did not wish to see it left to languish on my hard drive. Even if one person reads and enjoys the book in any of its forms, the writer in me will be satisfied. It will mean all of those many hours won't have been wasted. Plus, I'm greedy. No. I don't mean I expect to make much money from Dominion. I am greedy for readership, like all authors. We want people to read our words otherwise why would we write them down? So, yeah, greed and selfishness also prompted me to publish the book. Paradoxically I hope some readers are equally greedy to read my words. It will mean that I've done something worthwhile for us all. But if you prefer an eBook you can get it at Amazon.co.uk here and Amazon.com here . Good luck with the launch Matt. Thing I don't like about Amazon is that it's dead hard to shoplift the books.